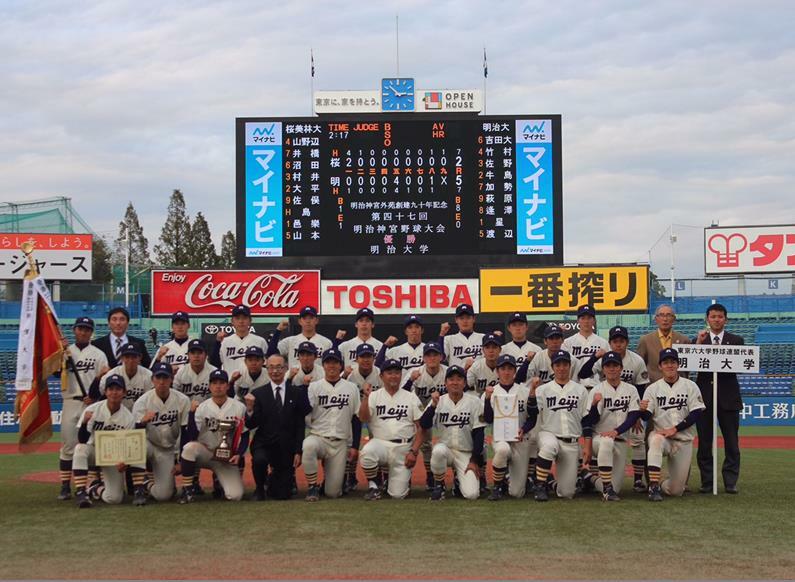 Meiji University (Tokyo Big-6) defeated J. F. Oberlin University (Tokyo Metropolitan Area University Baseball League) 5-2 on November 16, 2016 and set all-time record of their 6th win and the first win for Tokyo Big-6 in 5 years at the Meiji Jingu National Baseball Championship. Trailing 2 runs scored in the first inning by Oberlin, Meiji turned the game around by scoring 4 runs in the fifth inning. Pitcher Hoshi belted his first home run in Meiji’s uniform on 8th inning. Both teams have made it to the final by powerful pitching staff headed by Yanagi (first draft pick by Nagoya Chunichi Dragons) and Hoshi (2nd draft pick by Tokyo Yakult Swallows) for Meiji, and Sasaki of Oberlin (1st draft pick by Chiba Lotte Marines).